I guess that in the end the only way that you can see yourself really clearly would be to line up everyone in the world and get them to file past one at a time saying ‘the way I experience you is…’ assessing the flavours and issues, trends and perception you would get a pretty good idea of who you are. Doing what I do, that is working with people in the intimacy of self development, often through therapy, courses, and sometimes books, the opportunity for feedback is always a gift. We can only ever really see ourselves as others see us when we listen to feedback. However it is important to realise that just because someone says something it doesn’t mean that it is true. Just as beauty is said to be in the eye of the beholder, the bias of feedback is always in the eye of the beholder. People will project their own feelings on to you. A person who sees the world negatively will share negative feedback with you, just as someone who sees the world positively will share positive feedback with you. As the receiver of feedback you need to be discerning. So, how do you know which feedback is good to act upon and which is better given back to the sender? Well, the answer is quite simple; this is what your emotions are for. Emotions work differently to thoughts. Thoughts are considered and often take time to develop as we assess and balance and sift the wheat from the chaff. Emotions on the other hand are instant and give us immediate insight. How many times do I hear the story, after a situation has failed, ‘I knew it, I had a gut feeling that this would happen…’ I here it all the time. Generally, we are not very good at listening to our inner intuitive voice. Very often we know things and do not realise it. When it comes to feed back the trick is this. 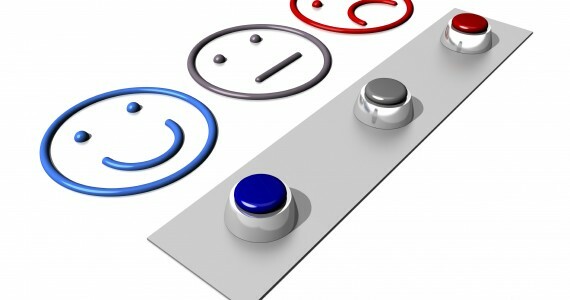 The nearer to you the feedback is, the more accurate it is, then the greater will be your sense of emotional arousal. Example: if someone tells you that you are a selfish pig and they hate you, if you have a sudden intake of breath, your heart beats faster and you start to react, perhaps with anger or upset, the chances are that the feedback is right and the person has just touched a nerve in you pressed your button. This feedback requires your attention. Or on the other hand your system remains normal and your level of emotional arousal is low or non-existent then the problem that is being given to you belongs to the giver and needs to be returned to sender. The greater your emotional response to something in either a defensive or attacking way the more it is likely that you really own it and it is true. The lesser your emotional response the more likely it is that the problem belongs to the giver. It is true that a psychopath, sociopath or narcissist will believe the feed back is wrong even when it is right unless it supports their point of view, but then I doubt that anyone with these issues would be bothered to read this anyway, and giving feedback to such people is always a waste of time. We should use feedback, but we should use it wisely. Being mindful of your emotions will keep you on target in your own self-development. 2 Comments on "Sorting the good feedback from the bad"
A lovely little blog there Sean, packed with some great advice. Throughout life i have come across many of these ‘positive’ and ‘negative’ people, some of which i have called friends. Unfortunately i would say these people were mainly negative minded, some at times foaming at the mouth with anger and jealous, and feedback from these people can be extremely difficult to decipher. Simply because like you say, they have projected their own ‘stuff’ onto me, and now i have to deal with it! I have learnt to adopt your approach and tune into my feelings when recently feedback. I will always be mindful of any type of feedback but unless i actually FEEL the feedback, i can’t relate to it (because its the other persons projection)and i have slowly learnt to let go of this negativity. Feedback truly is a wonderful gift, but sometimes it can be a Trojan horse in disguise. Very insightful, Sean – and a good reminder. It’s so easy to get caught up in other people’s opinions, especially when we have bad habits around these things in our past. Even amongst people we deeply value and trust, they can be just plain WRONG about us, and we have to realize this for a fact. I consistently say that, while it is good to use others’ opinions, as you say, as a mirror against which to measure our progress of sorts, in the end no one opinion is of any higher value than another in the larger picture. If we listen to one and take it to heart, why not all of them? Because the only opinion that really matters is the one we hold of ourselves as we strive to move forward. We can allow no one else’s voice to drown out our own. I am not perfect, but I am also nothing less than a beautiful disaster with unlimited potential. If I can still see hope through all my flaws, I have no business accepting less from anyone else. Thank you for sharing of your wisdom and experience, Sean!